This paper presents data indicating that pesticide use is widespread in the Cannabis industry, and that pesticide residue on retail Cannabis products is often found at levels exceeding the allowable levels on any agricultural product. Our approach in this white paper is try to balance these needs by giving recommendations that will exceed the public health protections in other industries, but not by more than is reasonable or necessary. This poster describes streamlined method development process for analysis of pesticide residues in MM using a QuEChERS sample preparation method, followed by GC-MS/MS detection and quantitation. Here, we present an LC-MS/MS method that uses atmospheric pressure chemical ionization (APCI) and the budget-friendly SCIEX Triple Quad™ 3500 LCMS/ MS system for the analysis of terpenes (major determinant of aroma) in cannabis products. Many reports indicate that when the majority of testing laboratories are given identical samples, they return results with very little correlation. FT-IR can accurately determine THCA and CBDA in dried cannabis flowers, giving a quick, convenient, and portable potency test for recreational and medicinal cannabis cultivars. We take a look at a selection of the best signs from the March for Science. 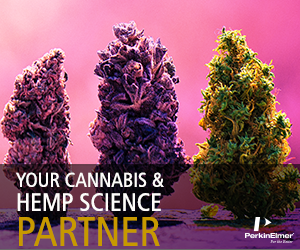 Analyze medical cannabis samples more easily and accurately with Restek’s new tetrahydrocannabivarin (THCV) standard. Individual reference standards are now available for dicofol, metribuzin, bromacil, lenacil, dodine, anilazine, captan, folpet, and pyrethrins.